The Dallas Cowboys have a great young team. The future looks promising with so many youthful players that will be around a long time. 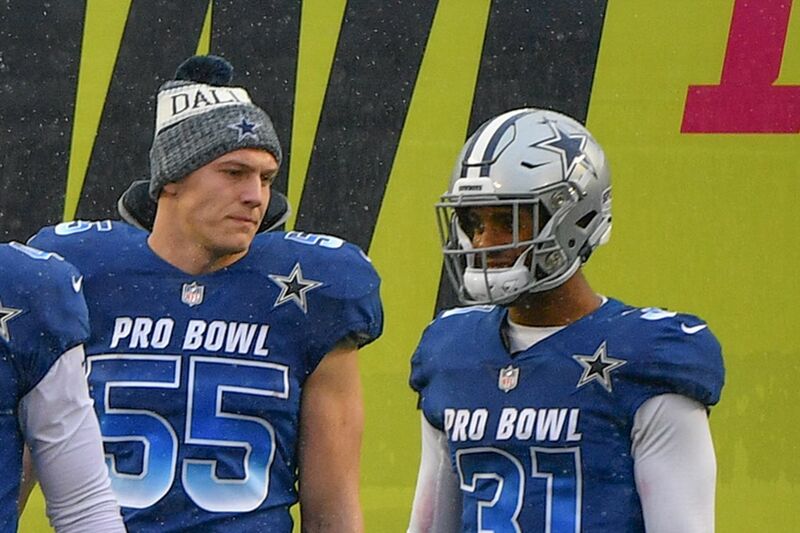 The Cowboys had eight different players make the Pro Bowl team, including five players on offense (Dak Prescott, Ezekiel Elliott, Amari Cooper, Zack Martin, and Tyron Smith) and three players on defense (DeMarcus Lawrence, Byron Jones, and Leighton Vander Esch). And that doesn’t even include Travis Frederick who has made the Pro Bowl in the last four seasons he’s played. He missed the entire year after being diagnosed with Guillian-Barre syndrome. The Cowboys have a lot of good players. Recently, Pro Football Focus released their top 101 list for the 2018 season. How did the Cowboys player do? Well, it took a while for their players to start showing up as the first 50 picks were made without a single Cowboy on it, but then things started picking up. Five players total made the list, including four of them from defense. Let’s check out where the Cowboys ranked. There was a time when people just weren’t sure about the pass rusher from Boise State. 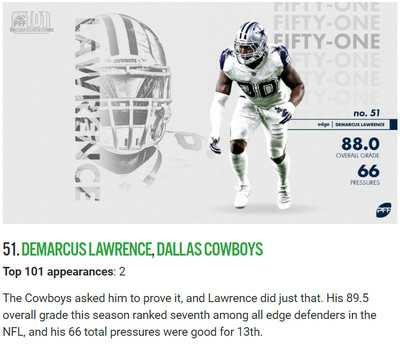 The Cowboys traded up to 34 to select Lawrence in the 2014 NFL Draft, but he got of to a slow start. He’s now put together three good seasons over the last four years. He was plagued by injuries in 2016, but he compiled 32.5 sacks over the other three seasons. He’s one of the top edge rushers in the game and it won’t be much longer until he’ll be paid like it. 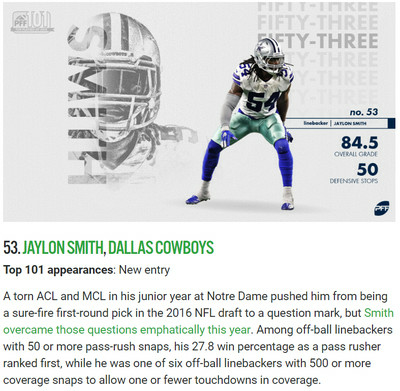 Many people thought the Cowboys wasted their draft pick when the gambled on Notre Dame linebacker Jaylon Smith in the second round of the 2016 NFL Draft. Like Lawrence, Smith was also selected 34th overall. And like Lawrence, Smith slid in the draft, however his stock dropped due to a serious knee injury he had in college. Well, Smith is healed up and we are now starting to see just how good he can be. With each new game, he continues to improve. Smith is part of that epic 2016 draft that has produced five starters for the Cowboys. The Cowboys have won the NFC East in three of the last five seasons and each time they’ve had a different starting linebacker duo. In 2014, it was Rolando McClain and Bruce Carter (Sean Lee was hurt). In 2016, it was Lee and Anthony Hitchens. 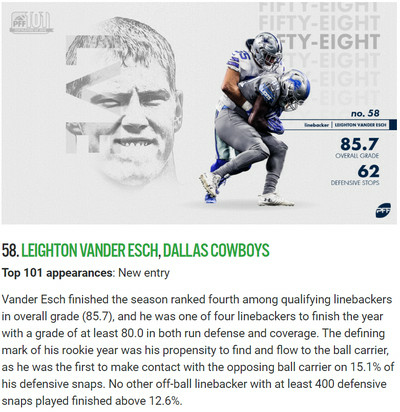 Last season, Smith and rookie Leighton Vander Esch held down the fort. LVE had an outstanding season becoming only the fourth Cowboys player to make the All-Pro team as a rookie. It just so happens that three of them have occurred over the last five years (Zack Martin and Ezekiel Elliott are the other two). But unlike these other guys, Vander Esch is the first defensive player to accomplish this. He’s going to be great for a long time. The team has found two young stars to roam around in the middle of the field and apparently PFF agrees. 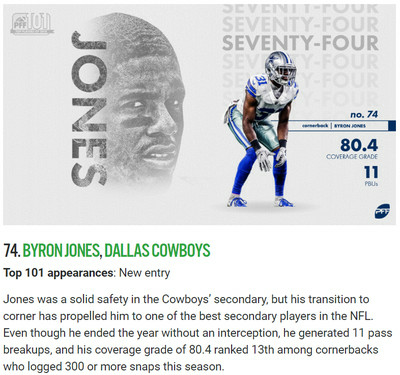 If you had your doubts about how good Byron Jones was, that’s understandable. Blame the coaching staff for not knowing how to use him properly. With the help of defensive backs coach/passing game coordinator Kris Richard, the move to corner has jump-started Jones’ career. Right from the get-go he established himself as one of the top corners this past season. Despite some tough match-ups this year (including four of the five highest paid wide receivers in the league), Jones held his own. It was a good year for the Cowboys young corner and he should be getting a new contract before too long. 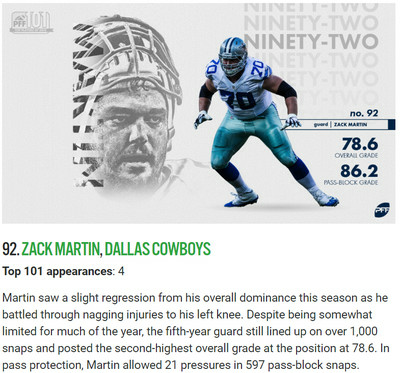 It’s been an eventful year for Zack Martin. In June, he got a six-year $84 million deal making him the highest paid guard in the NFL. Then, he missed the first ever game of his career with a knee injury. When the dust settled, he earned his fifth All-Pro honor in as many years. Despite dealing with injuries, Martin was still one of the games best interior blockers. Do you agree with these rankings? Did anyone get snubbed? I discount-double checked this list twice looking for Ezekiel Elliott, but he was nowhere to be found. Clearly the guy in charge of evaluating him must’ve had the year off.